"... So I've been here since the start, from the NOXPLODE days. I stopped for a short period as all the options out there were these tiny little concentrated scoops that really didn't do anything a Red Bull did. But then came along Pre-Jym and then this, a better version, Pre-Kaged. They are very similar but I'll stay loyal to Kris Gethin as he keeps in natural and safe ingredients. Jim doesn't, especially with the dangerous dyes. This gives me a slightly better pump and mental kick. Either one is a great choice, I would actually recommend to go back and forth to give your system a bit of a chance. Great flavor here too." 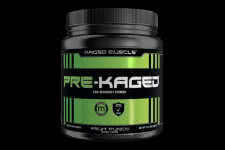 Easily the most comprehensive Pre-Workout drinks on the market! 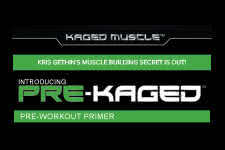 First came Pre-Jym, and then came the next evolutionary step in the pre-workout arena, Pre-Kaged! There is a reason this is the product of the year 2017 at bodybuilding.com, it's the best. Not a cookie-cutter formula put together over a few weeks, Kris Gethin instead spent years developing this supplement considering every aspect possible. This is the high performance of the class, no question about it. But, the drink also takes your health and well being in to consideration which is very, very rare in the industry. They don't use generic ingredients and they stay away from artificial colors and dangerous fillers such as bird feathers. The quality and amount of ingredients per scoop outweighs every single competitor. Each serving takes in to consideration optimal endurance, focus, strength, hydration and energy levels. With over 24 patents and 20 clinical studies, not many companies can even stand on the same platform. 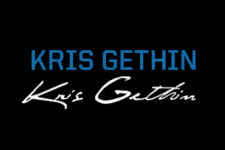 Trust Kris Gethin and his line, we do. It's time to take it to the next level, the question is.. are you ready?